Beautiful fresh flowers & plants for any occasion. Balloons,candy,costume rentals,costume deliveries,decorations & much more. O C Floral Designis a truly local, family-owned business proudly serving Oil City and surrounding areas and is committed to offering only the finest floral arrangements and gifts, backed by service that is friendly and prompt. Because all of our customers are important, our professional staff is dedicated to making your experience a pleasant one. That is why we always go the extra mile to make your floral gift perfect. We are more then just flowers. We also have our own Party store & PetStore. We can deliver a Fish tank complete set ups, Or a gold fish bowl w/flowers. Or a Plush costume charictor Dancing W/Music & photo delivering flowers or balloons. We even rent linen. We are family owned & we do our best to treat all, the way we would want to be treated .Caring family W/Values over 30 yrs. here. We guarantee everything we do & thats a guarantee from our family. Thank you, Jerry , Fredda & Jolene & All. Let O C Floral Design be your first choice for flowers. *Our shop is open from 8:30 a.m. to 6:00 p.m., Monday through Friday and from 10:00 a.m. to 5:00 p.m. on Saturday. We are closed on Sundays, but our answering service is open 24/7. We can take care of Sunday and holiday deliveries. 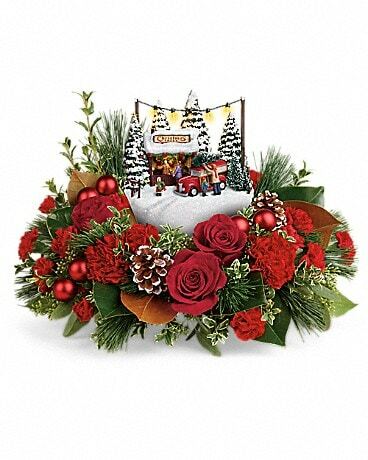 To help assure on-time delivery during the busy holiday season, place your order at least two days prior to the following major holidays: Thanksgiving Day, Christmas Day, New Year's Day, Valentine's Day, Easter, Administrative Professionals Week, Mother's Day, Memorial Day, Father's Day, Independence Day and Labor Day. Our shop will always be closed on the following holidays: Thanksgiving Day, Christmas Day, New Year’s Day, Easter, Memorial Day, Independence Day and Labor Day. Our shop serves: In Pa.Oil City Franklin, Cranberry, Seneca, Titusville, Fryburg, Tidioute, Tionesta, Venus. We preform Costume charicator Christmas showes for company christmas parties & home gatherings,all geared for all ages. All types of Costume deliveries. If you have any questions or need more information, please contact us at (877)626-0009. We're always here to serve you and make your flower-sending experience a pleasure.